Commercial cattle producers hold the key for the future of the Angus business. Outlined in this section are ways to make the most out of each registered Angus animal in your inventory. Take a minute to explore tips and resources for management, genomic tools, marketing, news and information. Headlines provided by the Angus Beef Bulletin EXTRA, a free, monthly enewsletter produced with commercial cattlemen in mind. Buyers of registered Angus bulls receive access to AAA Login, the Association’s online recordkeeping service. By using their customer code at www.angusonline.org, commercial producers are able to view weekly expected progeny differences (EPDs), manage their bull inventory, record calf records in the electronic calving book, update their AngusSource Marketing document, and order and view results for GeneMax DNA tests. AAA Login also serves as a portal to accessing the commercial-based records service, BRS, as well as MaternalPlus. MaternalPlus® is a whole-herd reporting program that can be used by commercial producers, and the reports derived from individual dam and calf data add value for profit-driven cattle producers. Building a cow herd with longevity and fertility, along with superior genetics, requires a thorough herd analysis. Start building a solid foundation in your herd by enrolling in MaternalPlus. Beef Record Service, or BRS, provides a system for commercial producers to keep performance records on their animals, regardless of breed composition. These records can help producers make selection decisions about their herd. Producers can submit information on their herd, including sire information, breeding records, calving and weaning data, and any additional performance or carcass data collected on their calves. This data can be submitted, viewed, and sorted via your computer online, or can also be submitted and returned on paper forms, printable from this site, or available through the Association. The Angus Optimal Milk Module is also a valuable tool for commercial producers. It allows you to input your current average cow weight and cow herd milking level, as well as your annual estimated pasture and feed costs to arrive at a milk EPD range matched to your needs. The Association’s Sire Evaluation Report is available in an online, easy-to-search format that allows breeders to quickly access performance information and genetic evaluations for the breed’s leading sires. There, users can also browse genetic trends, breed averages and descriptions for a variety of EPDs, dollar-indexes and more. 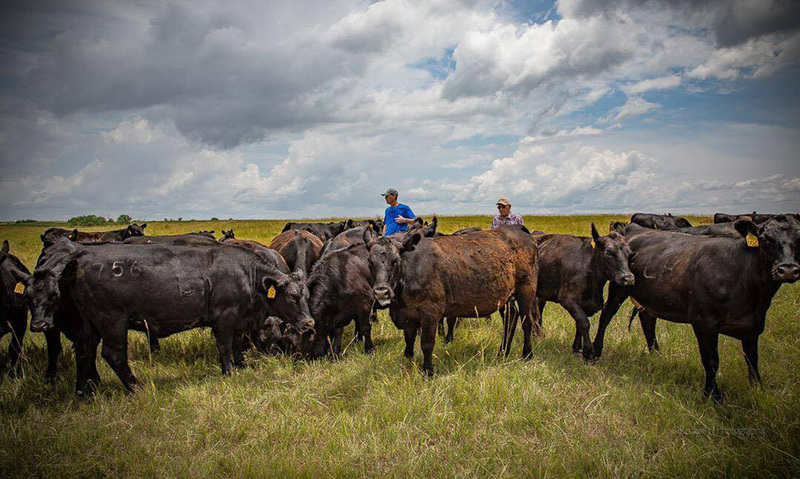 Certified Angus Beef LLC (CAB) also provides management tips for producers targeting quality. Tips available at www.cabpartners.com include EPD recommendations from the brand; identifying top-performing, quality calves; selecting for disposition; AIing; and more. It also includes the popular Best Management Practices manuals for both cow-calf producers, and stockers and backgrounders. Commercial cattlemen wanting to document the value of their calves also have access to a wide variety of marketing tips from Certified Angus Beef LLC (CAB), including tips for selecting the right feedlot, marketing on the grid and in niche markets. Access breakeven calculators for calf and fed cattle prices as well. Angus Black Book Mobile app is an online tool box. It will streamline your commercial cattle operation’s record keeping in the field. This app provides real-time recording of multiple data points to assist in profitable management decisions. Our innovative Angus Black Book commercial cattle record keeping app instantly sets up your cow-calf operation to start keeping records. The app is able to function on or offline without hassle. To get started download Angus Black Book mobile app on your smart phone. You can manage your entire herd via your smartphone. Producers have the option to visit the web portal www.angusblackbook.com to perform additional set up and management tasks for your herd. DNA technology is changing the way cattlemen approach selection decisions on the ranch. Angus Genetics Inc. (AGI) is dedicated to providing the latest genomic tools available to the beef cattle business. Learn how to properly take a DNA sample, submit results and more all on the AGI section of the website. GeneMax Focus is intended for use in prospective commercial Angus replacement females, cows or feeder cattle. Test features include genomic predictions for feedlot gain, carcass quality and grade, as well as an optional sire assignment. GeneMax Advantage is also intended for use in prospective commercial Angus replacement heifers or cows. Test features include ten individually reported traits and three multi-trait economic indexes expressed as simple Advantage scores, smart reporting for genetic outliers and optional sire assignment. Learn more about options available through AGI at www.angus.org/AGI. You can also submit a listing to the Commercial Angus Sales database, which compiles upcoming state association sponsored sales or sales hosted by seedstock producers for feeder cattle or replacement females at the auction market, at the ranch or through video and online sales. Click here to submit a listing. In addition, visit the Association’s Feedlot Listing page, where the Commercial Programs Department assembled a list of feedlots interested in Angus genetics. This resource includes vital information, services available and marketing options on each of the participating feedlots. Age and Source verification. Producers need to download, complete and return this enrollment form to get started. Please provide at minimum a copy of your calving records showing the date(s) of birth of your calves born from the group of calves you plan to enroll. Once you return this form give us a call or an AngusSource Administrator will contact you to complete your training. NHTC (Non-Hormone Treated Cattle). Producers who do not use hormone growth promotants should consider this program. An onsite review is required for enrollment. AS-NE3 (AngusSource Never Ever 3). Calves enrolled in this program will not have any growth hormone promotants, antibiotics or animal by-products used during their lifetime. An onsite review is required for enrollment. Calves enrolled in NHTC and/or AS-NE3 that are administered any non-conforming product can use the fall –out procedure to ensure the remainder of the calf crop retains the verification. AS-CCH (AngusSource Cattle Care and Handling). This program raises consumer confidence by documenting proper care, handling and management. Producers need to have a current BQA certification. AS-CM (AngusSource Calf Management). Calf health is an industry topic and improves buyer confidence. Minimum preventative vaccination requirements are required, additional vaccinations will be documented. AS-ASG (AngusSource Angus-Sired Genetics). Feeder calves that have been sired by a registered and transferred Angus bull qualify for this program. Registration numbers for bulls used naturally or AI will be a requirement. AngusSource…add a tag that adds value! It may sound simple, but identification is the first step to managing and marketing your calf crop successfully. Identification is a vital component for beef producer profitability. Visit the Custom Cattle Tags website for deals on ear tags from Allfex and Destron Fearing, EID readers and many other accessories. Is a feeder calf program that uses the American Angus Associations database to calculate scores and convey your calf crop’s genetic potential and performance to potential buyers. Enrollment is easy because it is a web-based platform and can be accessed at www.anguslink.com. What are the requirements for each enrollment group? Producers who provide historical bull information for past years will receive a more accurate score. Vaccination requirements include one round of blackleg, viral, and bacterial vaccines to be administered prior to shipment. Stay up-to-date with the latest industry information through the Angus Beef Bulletin, published with commercial cattlemen in mind and offered free of charge. Subscribe online, and while you are there, you can also submit your email address to receive the Angus Beef Bulletin EXTRA. The electronic newsletter is sent monthly and covers the latest in market trends, herd management, health and many other important topics. Stay connected with the Certified Angus Beef® brand through a weekly blog featuring columns from industry experts, research and white papers, social media, access to informational videos and other news on marketing Angus-sired calves to reach their full potential. More news and information for all producers — from seedstock breeders to feeders — is available through the industry’s largest communications center, Angus Media. The television news program The Angus Report recaps the week’s top cattle industry headlines on RFD-TV at 7:00 a.m. CST each Monday and 1:30 p.m. CST each Saturday, among other time slots. Check your local listings for more information or watch the show online. Contact the American Angus Association Commercial Programs department at 816-383-5100, or Ginette Gottswiller, director of commercial programs, at ggottswiller@angus.org, or Chris Engel, Director of Angus Link at cengel@angus.org. For more information or questions about accessing online commercial herd management tools, transfer requests, DNA testing, marketing opportunities and more, contact the American Angus Association.